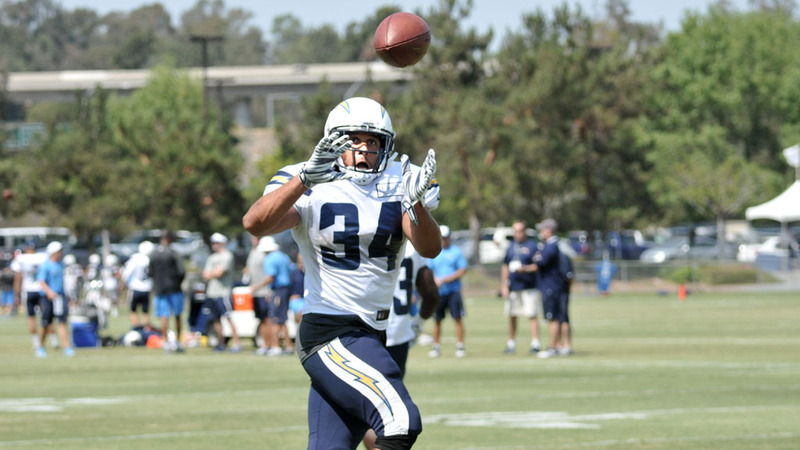 Running back Donald Brown makes a catch. A-plus to all of you following the Chargers’ stadium saga. This fight that is spewing more press, ink and arms than an octopu s— while wearing everyone out. Chargers will stay in San Diego if a stadium is built downtown with taxpayer subsidies. Chargers will stay if voters approve the Chargers’ backed ballot initiative for downtown stadium with subsidies. Chargers might stay if the NFL provides bigger subsidies and gets a downtown site. And the Chargers’ won’t stay if the Briggs initiative is deemed “illegal” as City Attorney Jan Goldsmith argues (which means lots of costly lawsuits and remaining at Qualcomm). See the pattern. Simple: taxpayer subsidies and a downtown site are minimum requirements for the Chargers to remain in San Diego. The problem is that Mayor Kevin Faulconer promised a vote on any use of taxpayer funds for a new stadium. But, he has already violated that promise with an expenditure of $2.1 million for an “environmental study” of just such a stadium. Giving more money to the Chargers is so unpopular, that Faulconer admitted, “I can’t think of one elected official who’s in favor of it.” Small wonder, the ballot initiative is 110 pages lacking specifics. Understandably, Faulconer wants more time to consider all of the legal, financial, and political consequences of any new stadium. And to get some serious questions answered. So, Dean Spanos (the team’s owner) has decided — after threatening to leave; trying to leave; being rejected by LA competitors and the NFL; and angering fans — that he can deliver the goods himself. He announced that he will be “the front man” to get — you guessed it — a new downtown stadium with subsidies. The problem for Spanos is that he is the wrong mascot for the Chargers, be they LA Chargers, San Diego Chargers, Las Vegas Chargers, Oakland Chargers, Denver Chargers, etc. But, he isn’t the only one carrying unfavorable baggage. The NFL, itself, is under greater scrutiny since the movie “Concussion” highlighted the brain-damage, serious injuries, and suicides among NFL players; plus the recurring episodes of drug use and domestic violence. Hence, the image problem and the need for a new mascot (regardless of which side you are on). My suggestion is the wildly popular, real-life escape artist, “Inky the Octopus,” who recently executed a daring night-time escape from his glass enclosure in a New Zealand aquarium. Inky’s escape has garnered world-wide press and amazement worthy of his name. Perhaps Inky was tired of being trapped behind glass and viewed by a noisy, ogling public. Evidently, he found a hole in his tank, crawled out, crossed the aquarium floor, then made his way to the ocean! Would that we could find the strength, dexterity and intelligence to follow Inky — a possible new Charger’s mascot — and escape the Stadium saga. I am certain Mayor Faulconer would welcome just such an option.